All persons voting during an election are required by state law to be registered. If you are not able to pre-register at least 21 days before Election Day, you may be able to register to vote on Election Day at your correct polling place location. To be eligible to vote, a person must be a U.S. citizen, at least 18 years of age on Election Day and a resident of Minnesota for 20 days. They must be finished with all parts of any felony sentence. A person can vote while under guardianship unless a judge specifically has revoked their right to vote. A person cannot vote if a court has ruled that they are legally incompetent. Register on Election Day by providing acceptable ID and registering with the Registration Judge in the correct polling place of the precinct in which you reside. If you are not registered to vote or need to update your registration information on Election Day, you may do so at your local polling place. 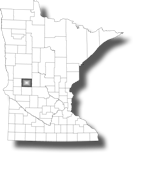 If you’re not sure which precinct you reside in or the polling place location, you may use the link in the right margin titled “MN Secretary of State – Voter Information Page” accessing the MN Secretary of State web site for assistance to find where you vote. Persons registering on Election Day must be a U.S. Citizen, at least 18 years old on Election Day and a resident of Minnesota for 20 days. They must be finished with all parts of any felony sentence. A person can vote while under guardianship unless a judge under the court of law specifically has revoked their right to vote. A person cannot vote if a court has ruled that they are legally incompetent.